"When there are people who are watching, it makes a difference"
Professor Stephen D. Reicher returns from acting as an international observer in Turkish court, as academics are charged with 'terrorist propaganda'. (Now with update). I am sitting in Court room 32 of Istanbul’s fortress-like High Court, observing the trial of a young colleague, Ekren [names are changed for the safety of those involved]. She is one of several people on trial today, fellow academics, journalists, even someone who wrote a short story in which the government was described as a ‘dragon’. Apparently that is enough to have taken before the criminal bench. Until she walked into the room Ekren didn’t even know what she what she was charged with. Now, she is told: terrorist propaganda. If found guilty she faces over seven years in prison. Ekren is a most unlikely terrorist or propagandist. She is a young social psychologist, a friend and a collaborator who – like me – is interested in group behavior and rocesses of intergroup conflict. Two years ago, in early 2016, she was one of 1,128 academics who signed a ‘peace petition’ which condemned the Turkish government’s attack on the Kurds for widespread attacks on civilians and humanitarian abuses and for fomenting further violence. Ekren was not a radical, let alone a seasoned activist. She simply despaired at the unfolding tragedy in her country and felt that something had to be said about it. The response of President Erdogan was swift and extreme. He denounced the signatories as anti-Turkish and as terrorist sympathisers, if not terrorists themselves. He then sought to get them sacked from their jobs. With deliberate ambiguity he called on all Universities to do whatever was necessary to deal with the signatories. Those working in public Universities were immediately dismissed as were some in private Universities. But other private University administrations stood up to this blatant assault on academic freedom and refused to do the President’s bidding. It wasn’t just that people were dismissed. They were denied the right ever to work in the public sector and details of their dismissals were put on their social security files to make it very hard to get any sort of job. They had their pension rights removed. They had their passports removed. They were denied any access to benefits or state services. Aisha, another colleague who was sacked, has a five year old son. When he was ill, she couldn’t use public hospitals. She had to take him to a private clinic. But she had no income. Aisha has had to sell up to keep going. She and her family survive, just. For now. 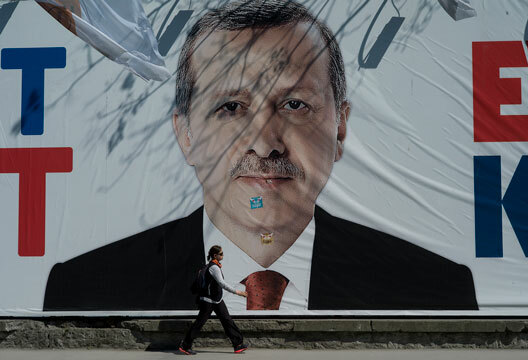 But the effect of Erdogan’s attacks is not just financial. It is psychological. Another young psychologist, Alisan, lost his research assistantship after signing the petition. He speaks of the isolation. Many of his past colleagues are afraid to be associated with him. He feel stigmatised. The networks that once sustained him are gone. The organisation ‘Academics for Peace’ which originated the petition, has approached the Turkish Psychological Association asking for mental health support for the signatories. Many are depressed. Many are anxious. Already there have been three suicides from amongst them. The whole strategy against those academics who criticised Erdogan is to take their academic identities away and turn them into non-persons. Now he is taking the strategy one step further – from taking away people’s livelihoods to threatening their freedom. Beginning last December legal proceedings were started against the peace signatories. Ekren still has her job thanks to a brave administration, but she is in the first wave of those being charged. In order to ensure that the government cannot act in the shadows, Academics for Peace has asked for international observers to come to the courtroom. We can show those on trial that they are not forgotten, that they are valued colleagues. If Erdogan wants to make them non-persons we, by contrast, can help them know that they matter as part of a broad academic community. Ekren is particularly passionate on this point. ‘Get people to come’ she says ‘when there are people who are watching, it makes a difference. It sustains us’. We can also shine an international spotlight on what is going on so that Erdogan is made accountable for his actions. Will it make any difference to government policy? It is hard to say. But Ekren’s lawyer makes another point. ‘Without your presence’, she says, ‘the judges are rude to us, they interrupt us, it is hard for us to be heard. However, when you are their they are much more polite and our voice does get through. The judges do at least have to appear as if they have respect for the rule of law’. In the end, Ekren’s hearing is brief. The court rejects an application to dismiss the charge on the basis that there is no evidence’. The dossier against Ekren simply contains the text of the peace petition and a commentary on this text. It does not show any connection to any ‘terrorist’ organization which is the basis of the charge. It doesn’t because it cannot. There is no connection. But the court does give Ekren time to prepare her defence. This too is part of a strategy. Keep people off guard, make them feel vulnerable, incapable of acting, certainly unable to question the government. What is going on in Turkey is a situation where the right to be critical of the state is being destroyed, where academic freedom is all but gone and where an independent civil society becomes impossible. As if to underline this, the night before Ekrem’s trial, police broke into the houses of 11 leaders of the Turkish Medical Association and took them into custody. The Association had issued a declaration in response to the recent Turkish incursion into Northern Syria. They made the seemingly self-evident statement that war is a disaster for human welfare. But in today’s Turkey simple truths are too much for the government. Erdogan called the Association ‘terrorists’. He described them as ‘filth’. He removed their liberty. Perhaps I personally am particularly sensitive to these issues and particularly attuned to the value of academic solidarity. My grandfather and great uncle managed to leave Nazi Germany and come to the UK through the support of the Academic Assistance council, precursor of today’s Council for at Risk Academics (CARA). But I think what is happening in Turkey, and the plight suffered by our friends and colleagues should be of concern to all academics and all those who value academic freedom. In the next few weeks we will be discussing with our colleagues in Turkey and with our academic associations (we went to Turkey under the auspices of the International Society for Political Psychology) what can best be done to help them. Ideas include an emergency fund for people like Aisha; sanctuary scholarships for those who can leave the country and academic collaborations for those who are able to work inside Turkey; honorary appointments to sustain academic affiliations – and a host of other ideas besides. When we have worked out the priorities we will post further information. Update: Yasemin Acar is a social psychologist working in Istanbul. In 2016 she signed the so-called ‘peace petition’ which called for an end to violence against Kurdish civilians in Turkey. As a result Yasemin was charged with terrorist propaganda and has been put on trial. She faces the prospect of a lengthy prison sentence. Here is Yasemin’s statement from the dock on Friday 22nd February. "Like my colleagues who have found themselves here in the last weeks, and who will continue to come here in the coming months, I am here because I tried to use my academic identity to voice a need for peace. I'm an assistant professor of social psychology, and have been living and working here in Istanbul for the past six years. I chose social psychology because I am the child of immigrants, and as such, felt that the places I lived and the collective history I shared shaped me into the person I am, but also left my identities fragmented between different places and cultures. I study identity, groups, collective action, and conflict. Some of my work also focuses on post-conflict peace. My work informs who I am. It helps shape me, and I hope, in some small way, the work that I do also shapes the world around me. Social psychology has taught me the importance of thinking critically. I have learned, and now I teach, that critical thought and critical action help to better shape our communities. Social psychology reminds us that blind followership, that dumb silence, helps no one. Criticism may not bring popularity, but it is the best way to serve the community as a whole, because the intent is to make our situations, and ourselves, better. When the petition came out it was a time when many of us were feeling hopeless. The peace process was over, there were curfews in a number of cities and towns, and though we couldn't see everything that was happening, we heard, from friends and family, and we read from the many national and international reports that came out of the region. So often at that time, the question "but what can we do?" was answered by "nothing." In social psychological research on collective action, we ask people about levels of engagement. That is, when people want to make their voices heard, how do they do so? In our measures, the least, the absolute minimum we use, is for a person to sign a petition. It is, at the same time, the most traditional and simple way for citizens to engage in political participation in democratic countries. I signed this petition, like many of my colleagues, because it was the least I can do, and because it was more than "nothing." Many of my colleagues on trial here are seasoned professors. Others are still PhD students, and others, like me, are just at the start of their careers. But all of us saw something that we wanted to speak out against, and found that, if nothing else, we could use our academic identities to do that. Maybe, we said, if we use this one social identity, this one aspect of ourselves, that we may be able to gain some attention to this issue. I didn't grow up in this country, but this is the home I chose. I haven't witnessed history here the same way many of my colleagues have, but that doesn't mean I don't know what violence looks like, or that I don't know the pain that conflict can cause. It is my duty as an academic to draw on my knowledge and my insight, to use my academic freedom and my freedom of speech, to better serve my community. That's what I did, and what I will continue to do. I reject the charges that have been made against me and my colleagues. I reject them because there is nothing in the petition that legitimizes violent action. It does not praise or legitimize any organization, as the prosecutor attests. It is nothing more than a call made to the state, within the scope of academic freedom and freedom of speech, to stop the deaths of civilians due to the ongoing conflict. The prosecutor's interpretation of the individual words of this text is an attempt to subvert the overall meaning of the text, which as it stands is a call for peace, and should not and cannot be interpreted as any sort of call to criminality or violence. Therefore, even the filing of a lawsuit based on this petition is a violation of freedom of expression, which is a constitutional right and guaranteed under international conventions (Article 10 ECHR). The prosecutor has tried, through this lawsuit, to add unwritten intent to this petition, and subverted it to suggest a forced association with an organization. I've been living in Turkey for six years. I made a choice to live here and make a life here. This case and my being here at all goes against my work as an academic, my ability to engage in free thought, and my personal beliefs. Therefore, I request that an immediate acquittal be made, considering that there is no action that can be taken based on the peace declaration." There were ten trials out of the same court today, so my hearing started almost 3 hours late. The prosecutor has made his decision about the verdict, but some of us requested a postponement so that we can figure out how to deal with sentencing. There are a few options. Three people did not request a postponement. The verdict is guilty, with a 1 year 3 month "postponed" prison sentence. That means that we're on a probationary period for the next five years, and as long as we don't commit any more "crimes," then we don't serve any prison time. If we do, then we serve for this sentence and whatever the new sentence is. For now, we have requested a postponement and will have our final hearing on April 4th. That day my lawyer will give her defense/closing arguments and the prosecutor will give the sentence. We are expecting the same sentence for everyone from this particular court, but at least we'll have more time to decide if we will appeal or accept the probation. I prefer appealing, but we'll have a meeting with the other lawyers and make a decision at some point in the next month or so.